Part 1 offered an overview and introduction to the blog series. Part 2 discussed Kiss Coaters and Squeeze Roll Coaters. Part 3 will go through Gravure Coating, Offset Gravure Coating, and Reverse Roll Coaters. Part 4 will wrap the series up, finishing with Transfer Roll Coaters and Other Roll Coaters, and then offer a brief Conclusion. 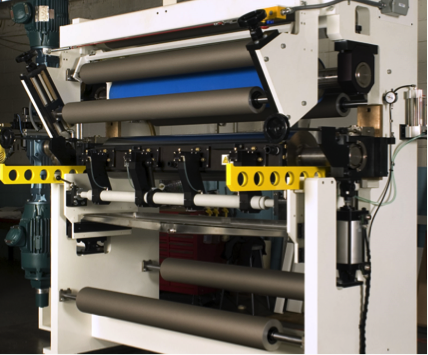 In direct gravure coating an engraved roll is used to control the amount of coating that is delivered to the web. This engraved roll (often referred to as the gravure or applicator roll) typically features a steel or ceramic surface into which a cell pattern is engraved. Coating is introduced to the surface of the engraved roll either via a pan that the roll is partially submersed in or by an enclosure that holds the coating against the roll. Once the coating is introduced to the rotating roll’s surface, a blade is used to wipe off any excess. As the roll continues to rotate the coating is introduced to the web at a nip point formed between the engraved roll and a rubber covered backing roll (Figure 3 and Photo 3), with both rolls rotating in the same direction and at the same speed as the web. The coating is transferred to the web by the nip force between the rolls. The size and shape of the cells are the primary factor in determining the amount of coating that is delivered to the web. However, other factors such as the rubber thickness and hardness; doctor blade construction, angle and pressure; coating viscosity; web properties and surface; and operating speed also affecting the coating laydown. Under a given set of operating parameters the coating application rate of a direct gravure coater is highly repeatable. However, changing of the coating laydown rate can be time consuming, requiring that the gravure roll be changed to a different pattern. Table 3 (below) shows the typical operating speeds, coating application rates and coating viscosity for a direct gravure coater. As indicated, the viscosity of this type of coater is limited. A variation of direct gravure coating is reverse gravure coating, where the gravure roll’s rotates opposite the web. The coating is split between that which is transferred to the web and that which remains in the gravure roll’s cells. Unlike direct gravure, where it is important to wipe the surface of the gravure roll clean, light doctor blade pressure is often used in this method so that coating stays on the surface of the gravure roll (as well as in the cells). In addition to the factors mentioned for direct gravure coating, the laydown rate for reverse gravure coating is affected by the gap between the rolls and the speed of the gravure roll. The speeds and coating thicknesses are similar to those shown above for direct gravure coating. However, it is typical that the coating viscosity is slightly higher (0.01 – 2 Pa.s). The gravure coater has a mid-level price. It is easy to operate, is fairly low maintenance, has a good speed range, handles a fairly wide viscosity range and gives highly repeatable coating rates. Its drawbacks are the fairly limited coating thickness range and the difficulty in changing the coating laydown rates. Change over from one coating to another/clean up can be time consuming, with a significant amount of time potentially required to either clean the roll or replace it. Offset gravure coating is a variation of the previously described gravure coating where an intermediate roll is used to transfer the coating from the gravure roll to the web. This intermediate roll, which is often referred to as an “offset” roll, is rubber covered and is located between the gravure roll and the backing roll, which now features a hard surface such as chrome plated steel, with the web passing through the nip formed between the offset roll and the backing roll (Figure 4 and Photo 4). The previously described features and hardware associate with the gravure roll for direct gravure coating still apply. The size and shape of the engraved roll’s cells are the primary way of determining how much coating is delivered to the offset roll, which typically runs at the same speed as the gravure roll, with one roll turning clockwise and the other counter clockwise. The speed ratio of the offset roll to the web as well as their relative direction with respect to each other greatly affects the amount of coating applied to the web. Table 4 (below) shows the typical operating speeds, coating application rates and coating viscosity for an offset gravure coater. The offset gravure coater has a slightly higher than mid-level price. It has a good speed range, handles a fairly wide viscosity range and is good for changing coating laydown rates. Because it does offer the ability to change the coating laydown rate, it can be a somewhat difficult to operate and can have issues with repeatability of coating rates. Its maintenance is typically a little higher than those methods previously discussed and it has a fairly limited coating thickness range. Change over from one coating to another/clean up can be time consuming, with a significant amount of time potentially required to either clean the roll or replace it. A reverse roll coater is a multi-roll coater that uses a series of rolls to pre-meter and apply a coating to the web. A typical reverse roll coater features three rolls, all rotating in the same direction. In a nip fed reverse roll coater the coating is puddled in the gap formed between the metering and applicator roll, both of which are of precision steel construction. A layer of coating forms on the surface of the applicator roll as it rotates away from the coating puddle. The thickness of this layer is determined by the gap between the metering and applicator rolls, as the coating passes between them. As the coating continues to rotate about the applicator roll it is wiped onto the web, which is traveling in the opposite direction on the rubber covered backing roll (Figure 5 and Photo 5). A variation of this design is a pan fed reverse roll coater. In this arrangement the coating resides in a pan in which the applicator roll is partially submersed. As the applicator roll rotates, it picks the coating up out of the pan, passes it through the gap formed with the metering roll and then delivers it to the web at the backing roll. This arrangement is particularly useful with coatings near the lower end of the viscosity range where holding them in the nip between the rolls would be difficult. The amount of coating that is delivered to the web is controlled by the gap between the metering and applicator roll as well as the relative speed of the applicator roll and web speed. The greater the gap, the thicker the layer of coating. The greater the speed of the applicator roll, the more coating that is delivered to the web. Table 5 (below) shows the typical operating speeds, coating application rates and coating viscosity for a reverse roll coater. There are several variations of the reverse roll coaters, such as four roll versions, which are designed to meet certain requirements and parameters. The reverse roll coater is an expensive coater to purchase. It has wide coating thickness and viscosity ranges and is good for changing coating laydown rates. Because it does offer the ability to change the coating laydown rate, it can be a somewhat difficult to operate and can have issues with repeatability of coating rates. It typically requires more maintenance than those methods previously discussed and is limited in its speed range. Because of the number of rolls involved in the coating application change over from one coating to another/clean up can be time consuming.